Sloane Stephens said her own fashion sense is still developing, but she's a big admirer of the styles of Maria Sharapova and Serena Williams. 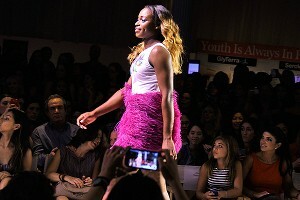 Before Sloane Stephens walked the runway at New York Fashion Week, she sat down with espnW to answer a few questions, such as which Grand Slam she thinks she'll win first, how she spends her time off the court and what she learned from her war of words with rival Serena Williams. The 20-year-old flew in from Los Angeles specifically to take part in the Just Dance with Boy Meets Girl fashion show where all the outfits on the runway were inspired by the look and feel of the Just Dance 2014 game. Stephens had the best season of her young career in 2013, advancing to the semifinals at the Australian Open, the quarterfinals at Wimbledon and the fourth round at both the French and US Open. espnW: What were your takeaways from your play this year at the US Open? Sloane Stephens: I thought I played really well. This summer, going into the bigger tournaments, I started to play better; things started going better. I thought I did well getting into the fourth round. 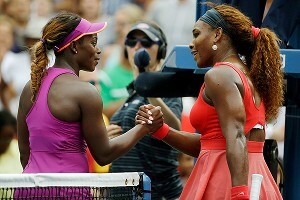 Obviously, losing to Serena is tough. But other than that, I thought I did well -- thought I had a good summer. espnW: How can you go about being more consistent between Slams? Stephens: Definitely, I need to bring it up in the smaller tournaments, because a lot of your ranking comes from those smaller tournaments. Right now, my whole ranking is based on the Slams. I definitely want to boost that up a little bit, because there is a lot of room there. I think next year that will be a good goal for me, try to do better there, be more consistent. espnW: Is there a specific reason you've struggled at smaller tournaments? Stephens: I want to play my best tennis at the Grand Slams. I focus a lot on that, and the smaller tournaments have just been building blocks. I've just tried to get ready, play my best tennis, but also knowing things may happen and you may not win, you feel a lot less pressure. espnW: How do you feel about the state of U.S. women's tennis? Sloane Stephens said her war of words this year with Serena Williams was a learning experience and that "we're all happy now." Stephens: I think it's pretty good. I don't know how many [American] girls are in the Top 100, but there are a lot. I think it's going well. Obviously, compared to the men, who only have a few top players, I think we're doing well. But girls develop faster than boys, so you can't compare. But I think it's great. There are a lot of us, and we're all under the age of 23 or so. espnW: What's standing between you and a breakthrough at a Grand Slam? Stephens: Not playing the eventual winner at three of the floor Slams would be helpful! I lost to Victoria Azarenka in Melbourne to win the tournament. French, I lost to the finalist. Wimbledon, I lost to the winner. US Open, I lost to the winner. I mean, so, not playing the eventual winner would be a little bit helpful. And, of course, time, just time. I was really pushing to be a top-16 seed at the US Open, but then it was horrible because I got Serena, so it was pointless! I wish I would have stayed 17 or 18. But, definitely more time and obviously better seeding, and sometimes you just have to get lucky. It will come. espnW: What have you learned from the off-the-court stuff that has gone on between you and Serena? Stephens: I think we've all had our little tiffs, and I think this year has definitely been a learning experience. Because we've had so many different things happen. But, overall, it's been a learning experience. I think it's good that we're all happy now. We all love each other. I think we should stay like that because it's easier that way -- easier to love each other than hate each other. So it's good now. espnW: Which Grand Slam do you think will be your breakthrough? Which do you feel most comfortable at? Stephens: I would probably say the French Open because I love clay. But I just see myself on a hard court, too, so I don't know. espnW: So you're hedging your bet there with two different Slams? Stephens: [Laughter] Yeah, something like that. 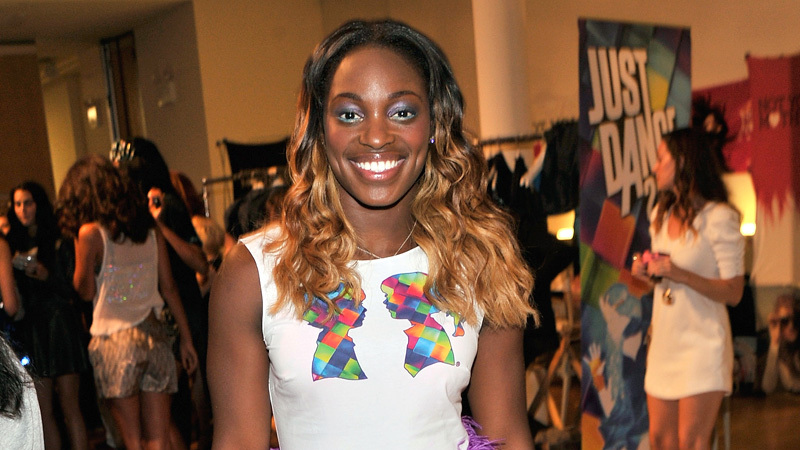 Sloane Stephens got to walk the runway at the Just Dance with Boy Meets Girl show at New York Fashion Week. espnW: What are your off-the-court pursuits? Stephens: Fashion. Food. And friends. Fashion first. I'm an online shopper, so that's what I do in my free time. A lot of online shopping and I just like to see new styles and new people. And this fashion line -- Boy Meets Girl -- I find interesting. It's good to learn about new things and see new things. espnW: Is this your first time walking in a fashion show? Stephens: Yes, first time. My walking is not good. I was practicing earlier; it's not very good. espnW: What do you see as your future in fashion? Stephens: I don't know; I just love fashion. I just love the whole magazine thing. I definitely want to get into it, but I don't know what I'll do yet. I think I'm just going to ask Jessica Simpson what she did and follow her! I definitely see myself doing something, because I love it. I came all the way from L.A. just to do this. Hopefully something soon, but I'm too young to be doing anything serious. espnW: What's your fashion style? Stephens: Well, my mom picks out my outfits. So it's still in the works. espnW: What have you learned from Serena and Maria Sharapova about how they built off-the-court brands? Stephens: I'm so much younger than them, so wearing high heels like that, or the dresses they wear, it's a little over the top for me. Whenever I want to wear something like that, my mom is like, "No." They are businesswomen. Sharapova is super sleek, and I love her look. And Serena is very glamorous and everything, so they're definitely different types of fashion. I Google them to look at their pictures, their red carpet appearances, see what they're wearing that week. espnW: You had mentioned last year that in order to play better, you had to have fun on the court. What became not fun? Stephens: I think I was so stressed, I felt a lot of pressure after the Australian Open. I was like, "What do I do now? What am I supposed to do now? How good am I supposed to be?" Everyone is expecting me to win and I just felt a lot of pressure and I didn't know what direction I was supposed to be going. I got really busy. I had a lot of obligations. It just became overwhelming. We woke up at 4 a.m. one morning to do a satellite media tour all day on video. I was just like, "This is not what I signed up for." Looking back, I realized I did a bunch of stuff that was totally overwhelming for me, because I wasn't used to it. I think I regrouped nicely from that. I learned things about myself -- the things I don't want to do, the things that I do. And that I should engage myself more in the things I love. espnW: Do you like the spotlight? Stephens: It's OK. You have to be a little bit more careful with what you do. But other than that it's enjoyable, people telling you they love you all of the time; it's nice.